The T-2 was another product of North American Aviation producers of the legendary T-6 Texan (Harvard) piston radial powered trainer. Whilst the Texan was the mount of a whole generation of piston powered pilots the Buckeye that had its first flight on 31 January 1958 went to on to serve well into 2008 as the mount of 11,000 plus new pilots in a jet powered aircraft. Buckeye, whose wing was based on that of the companies Fury and whose cockpit controls were similar to that of the T-28 Trojan which replaced the Texan, was designed as a true all-purpose trainer. 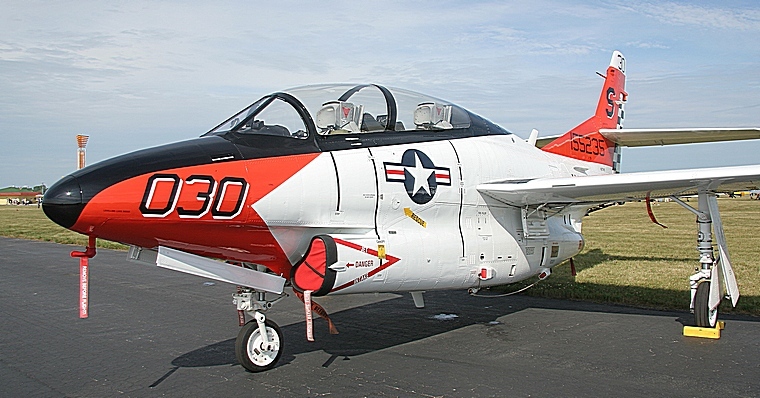 In a production run that ran from 1958 to 1970 during which 529 were produced it introduced new pilots into the world of jet aircraft and would be used to teach them high speed aerobatics, day and night navigation, carrier operations, basic radio procedures, instrument flying and gunnery and bombing skills. In line with most modern training aircraft the rear seat of the dual control tandem Buckeye is elevated to provide both the pilot and student with excellent visibility. Safety has not been compromised and it is fitted with ejection seats that can be deployed from ground level to 50,000 feet at speeds from 55 to 525 knots. Buckeye is a rugged aircraft, designed to withstand carrier landings and the rigours associated with training aircraft. It's widely spaced tricycle landing gear provides excellent control during take-off and landings, it is a stable platform with low stall speed and is above all forgiving, the trade mark of an excellent training aircraft. 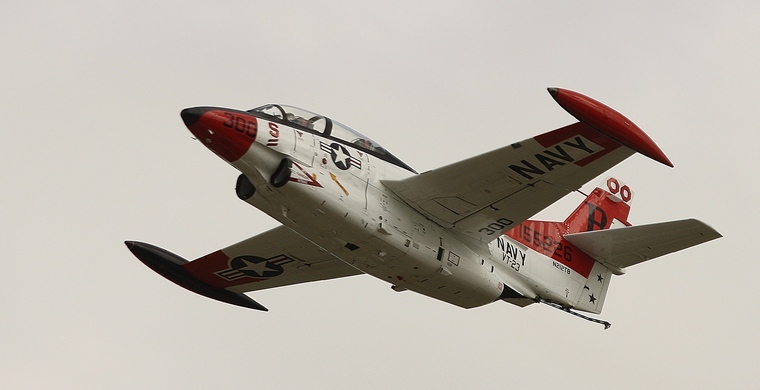 The original version, the T-2A was powered by one Westinghouse turbojet whilst the T-2B flew with two Pratt & Whitney turbojets. 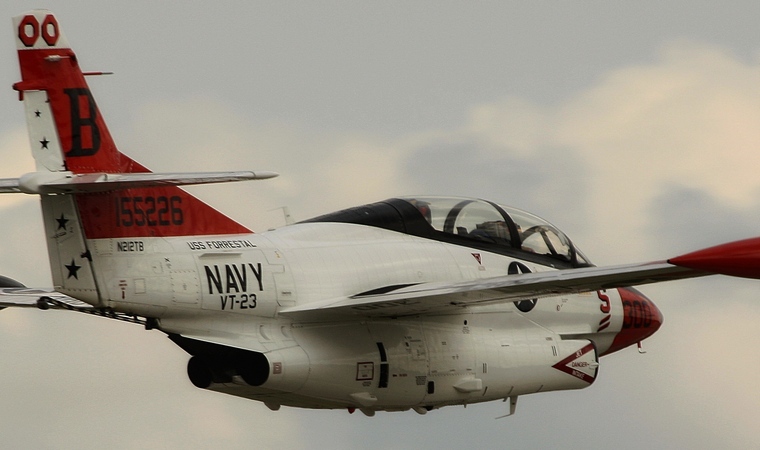 The third version, the T-2C was powered by the more powerful General Electric turbojets and its performance was better than that of the U.S. Air Force's T-37 Tweet but inferior to the U.S. Navy's TA-4J Skyhawk. Although carrying no build in armaments provision was made for the installation of pods in under wing hard points that could carry two .50 machine guns as well as 45kg of practise bombs or rockets. Two variants, the T-2D and T-2E, were exported. The T-2D of which 12 were built were sold to Venezuela for service in that countries air force whilst 40 T-2E's found their way to Greece and served with the 263nd Air Training Squadron of the Hellenic Air Force. 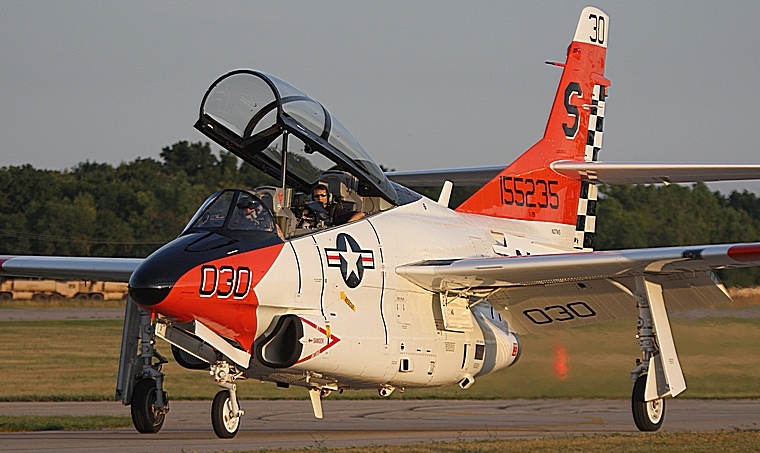 The T-2 was replaced in US Navy service by the T-45 Goshawk, a US version of the BAE Hawk. That however was not the end of the distinctive Buckeye, a number has been converted as director aircraft for aerial drones whilst several has been sold to private collectors and are regular performers at air shows. One flies in South Africa although it has not been seen at shows for a couple of years.